Woking forward Giuseppe Sole says they will not get carried away with their start to the new Conference campaign. The Cards are the only unbeaten team in the league and sit third in the table following Tuesday's win at Aldershot. "We are a part-time club but are aiming high. We are a small squad but have real quality," Sole told BBC Surrey. "It's nice to get a good start and see where we are come October or November, when we'll get a real picture of where we're going to be." Woking boss Garry Hill led the club to tenth place in the Conference last season, finishing nine points off the play-off places, and Sole is hoping to improve on that this term. "The past couple of seasons we have been building but the starts have killed us," the 26-year-old said. "Garry has always brought really good players in and he has kept a strong nucleus from last year. "He said to us that this is the best squad he has had in his time at the club and it is exciting." 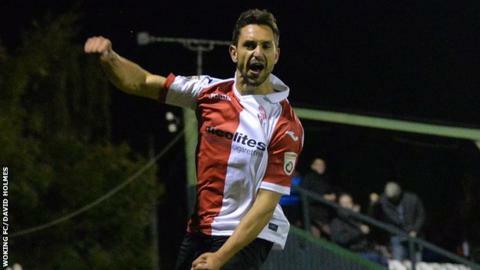 Sole scored the winner against the Shots on Tuesday with a 35-yard free-kick, taking him four shy of a century of goals for Woking. "It was quite a special one," he said. "I thought 'why not? ', hit it and it flew in. It was nice, especially at Aldershot. "It will be a huge relief when I get to that hundred, I'm very aware of it." "It was a wonderful goal. I must be honest - me and Steve Thompson stood there and said 'Is he mad or what, shooting from that far out?' It was an unbelievable strike." Sole, who came through Woking's academy, says he is enjoying his football after missing most of the 2012-13 season with a serious knee injury. "When I did my injury there was a 50-50 chance I wouldn't play again," he said. "I was lucky enough to come back and be able play for Woking. "I get paid to play for my hometown club in front of great fans. "This season I feel great and fit and have a lot of confidence in my teammates and the management team. I will try and play with a smile on my face."